At the beginning of May, I spent a week in paradise, otherwise known as IBIZA. Now, Ibiza has a reputation for being seriously wild and crazy, but does it really live up to it? So, an unequivocal YES! Ibiza was awesome, and one of the most beautiful places I’ve ever been. It was a nice surprise, especially as the U.S. party city Las Vegas was a bit of a letdown. Apart from the hedonistic tourist attractions, Vegas is pretty empty and soulless. Ibiza, on the other hand, is incredibly beautiful. F.Y.I. – did you know the old town center is a UNESCO World Heritage Site? Well, that’s not the thing most people associate with Ibiza. 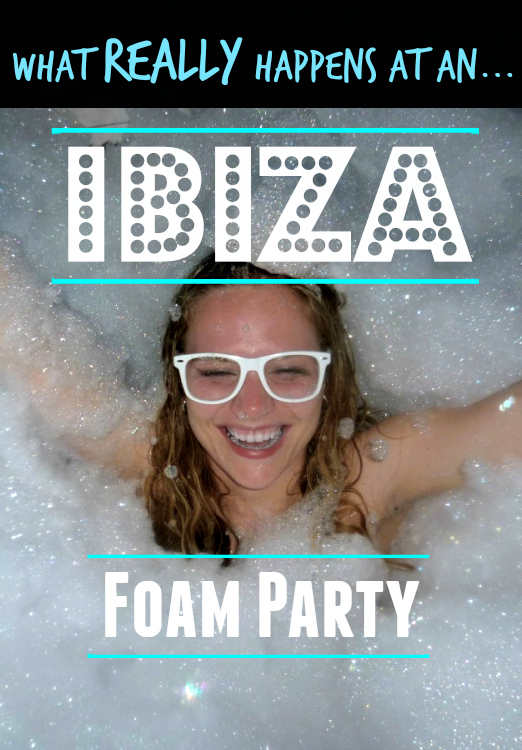 It’s stuff like electronic music, white sand beaches, beachfront bars, and of course…foam parties!! I got the chance to go to an Ibiza foam party at the superclub Eden, but first we started off the night with a beach party. 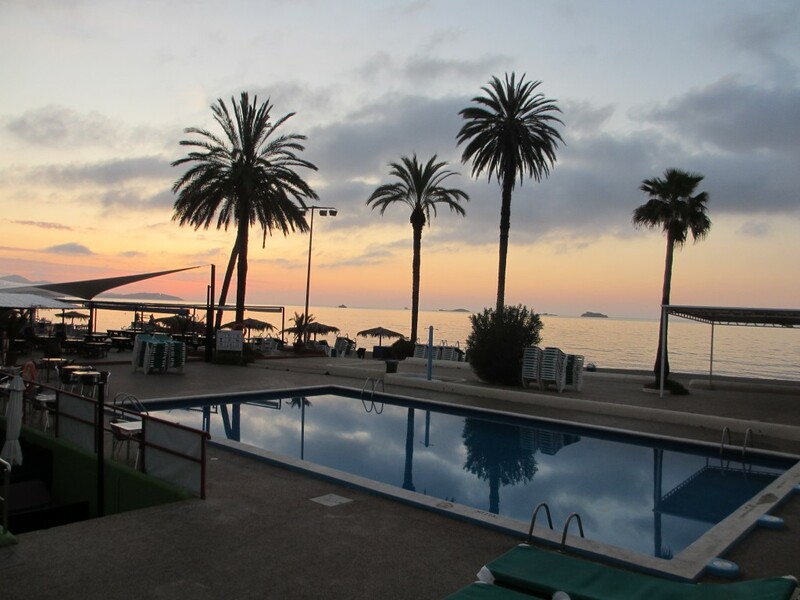 More specifically, at the legendary Café del Mar, home of chill-out music, to watch the sunset. Afterwards, we had a quick dinner, wandered to the port, and hit the bars before finally heading into Eden late at night. We walked into the gigantic club, dressed all in white, and partied hard until 4:30 a.m. – when the foam was supposed to descend. We left our bags in a safe area, then pushed into the middle of the dance floor, right where the foam was going to come from. The lights flickered on and off, the music got more and more intense, and you could practically smell the excitement on the crowd…. It happened again. And again. And again. Finally, a giant shower head came down from the ceiling and foam cannons came out of the upper level balcony. Everyone held their breath and stared up at the balcony with huge grins on their faces. After a delightfully agonizing pause, they started pumping out foam, and everyone went wild. Within seconds, the foam was waist-high; a minute or so later, and the foam was about six feet high. At 5’2, I went under pretty quickly. When I breathed in, I got a mouthful of soap and dry bubbles…and absolutely no air. I was desperately wiping foam from my mouth, nose, and eyes as I scrambled to get out of the middle and onto higher ground. We danced wildly on the edge of the central dance pit, hanging on the railing, laughing with joy, and occasionally helping pull slippery people into a breathable space. 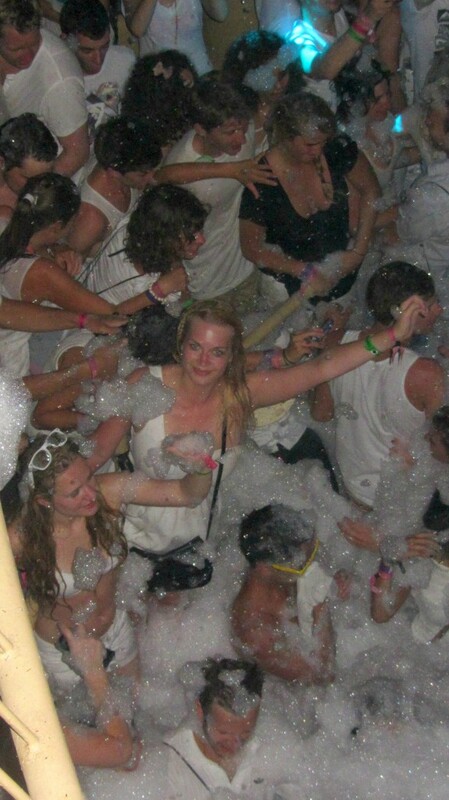 Every so often, we’d dip into the main foamy dance pit until the foam got too tall, then jump onto the railing again. We were absolutely covered in bubbles and foam and had huge grins plastered on our faces. Then, just as people were thoroughly soapy, the shower head turned on and huge jets of cool, refreshing water poured down to clean off the dancing crowd. We ran in and enjoyed getting rinsed off and back to a normal state. But that wasn’t the end – pretty soon, new foam was blasted out and everyone was leaping in and out of white, fluffy mountains of bubbles again. Around sunrise, people gradually started heading out. We slid our way to the bathrooms. Just imagine how hard it is to walk across a dance floor covered in slippery suds. Luckily, one of the girls had been before and knew the trick to surviving after the foam party – warm clothes! We did our best to de-suds ourselves, then happily pulled off our soaking white outfits and pulled on warm sweaters and leggings. It wasn’t that cold, but being damp after hours of dancing made it feel awfully chilly. Currently listening to: “One Night in Ibiza” by Mike Candys & Evelyn ft. Patrick Miller (but of course). OH COOL! I went to a foam party once here in Cancun, and it was a ton of fun. 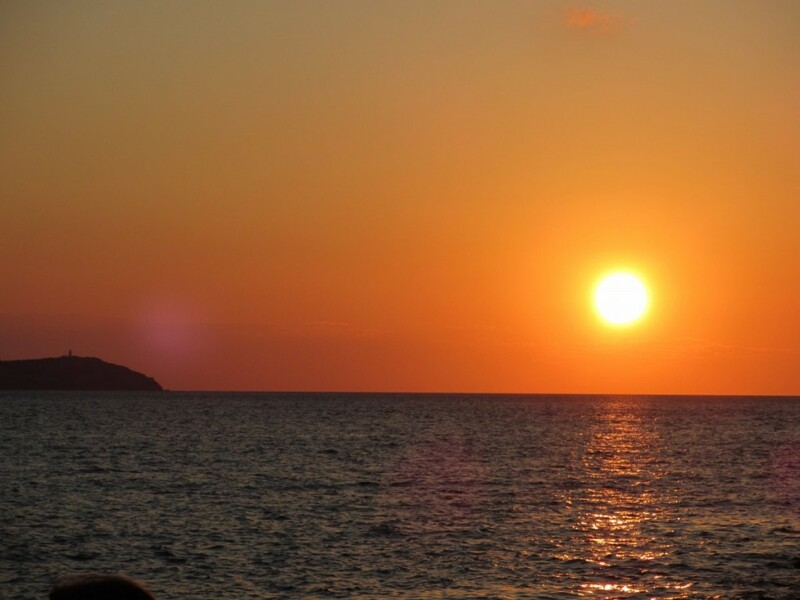 Love your pics, and I really want to go to Ibiza now. Thanks! Foam parties are a lot of fun, and Ibiza is definitely a really fun place to visit. Haha that’s a good way to put it! It definitely was, I highly recommend the experience. Brings back wonderful memories of when I used to go to Ibiza 10 years ago. Too bad I went there off-season. Would’ve loved to do this! Thanks for sharing. It was a blast! Definitely an experience I recommend. 🙂 I was there just before the regular season opened, but I went with such a big group that they opened the clubs specially for us. How fantastic, I envy your life hehe! 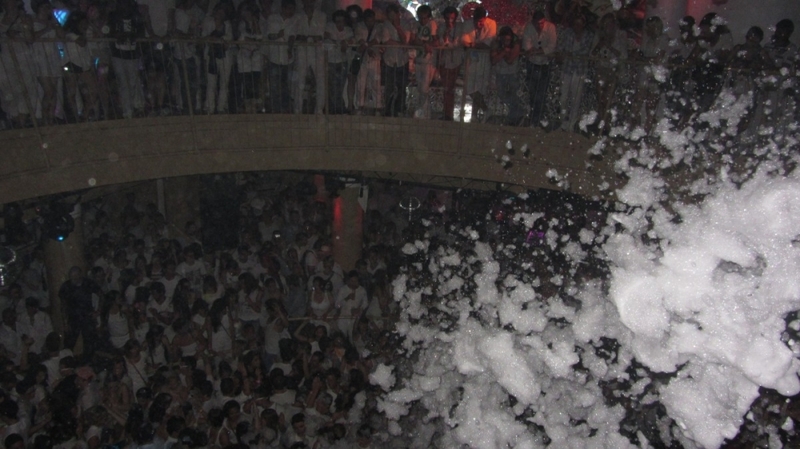 Haha if you get the chance, I highly recommend an Ibiza foam party! They’re pretty fun. This sounds like a blast!!! 😀 I was smiling as I read this article because something this fun seems pretty hard to beat, with the loud euro club music and all of the foam!! Haha thanks! I’ve gotta say, it was a pretty unforgettable experience. I would definitely do it again! Ahh that looks like so much fun, I’m going there next year (which is ages away still :s), can’t wait! Yess, it’s a must-do! Haha they are SO much fun. They’re just a cherry on top of the Ibiza party scene. Hello Jessica! It really sounds like a fun place! I’m planning to there soon! Quick question, you mentioned that you were there at the beginning of May, right? Do you think that was a good season to go? Were there much people? Thank you! Hi Cristhian! I had a great time at the beginning of May, but I went on a huge trip with lots of my friends. I would actually recommend going a little later, because things were just starting to open up so the island wasn’t in full swing. You’d also get nicer weather later. It was sunny, but it would definitely be nicer if it were warmer at night. Wow, what a fantastic foam party. I love this party.